Oasis. Franz Ferdinand. The Killers. Kings of Leon. These are the headliners at the biggest music festival in Spain, which is taking place from the 16th to the 19th of July. This festival features an unbelievable lineup of well-known acts, including Maxïmo Park, Paul Weller, Lily Allen, Peaches, Calexico, Pete Doherty and (personal favorite) TV on the Radio. Over 45,000 people are expected to show up every single day, which is astonishing, especially given the difficult financial times we’re living in. Approximately 44,995 of them will be British and 44,990 shirtless and drunk. 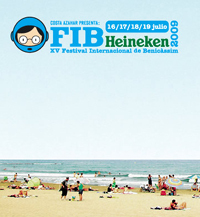 Benicàssim is a tiny coastal town in Castellón province, and this festival effectively quadruples its population. If you’re lucky enough to have gotten tickets, give us a shout to let us know how the festival is! So Spanish festival goers wear shirts and stay sober? Not at any festival I ever went to here.